Tomatoes are the edible fruit of the tomato plant which originates from Central and South America. 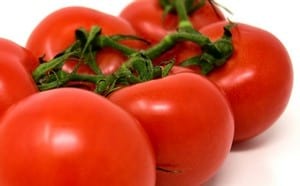 Even though from a culinary point of view tomatoes are considered to be vegetables, they are actually a fruit. Tomatoes mostly consist of water, but they also contain sugars and dietary fiber. Like other fruits, they should be considered as a treat for your rabbit. This means that they should be offered in limited quantities as feeding too much will lead to digestive troubles. Can Rabbits Eat Tomato Stems, Vines or Leaves? Although rabbits can eat tomatoes, they should not be fed stems, vines, leaves, and green unripe fruit of the tomato plant. The reason for this is that the tomato plant is part of the nightshade family. Many members of this plant family contain potent alkaloids, and some are highly toxic. However, we are not able to conclude that by default the tomato plant is toxic for all rabbits. It really seems to depend on the tomato plant and on the rabbit. We even came across accounts where people state they have fed tomato plants to their rabbits without any problems. Our advice is to not take the risk and only feed the actual fruit. Conclusion: to sum up, yes rabbits can eat tomatoes, but only the ripe ones and in small amounts. Do you feed your rabbit tomatoes? Let’s us know below.